The space sector has been increasingly moving from specialized activity within the domain of superpowers and large industrial conglomerates and corporations to a more democratized and accessible undertaking. The spur of new actors, both public and private, as well as emerging space countries, creates a new impetus for space agencies and governments as key space sector enablers. In this viewpoint, we present the current dynamics in the space industry and recommend roles for the future agency that can help decision-makers to realize their national space sectors’ full potential and establish a flourishing space sector in the era of Space 4.0. Over the years, the space sector has undergone multiple transformations, as illustrated in the Figure 1 below. Since the dawn of humankind, we have gazed at the stars in awe; and when early astronomers such as Galileo Galilei introduced the organized study of the universe, Space 1.0 was born. Fastforward to the 20th century, when nations quickly developed ambitions to expand human presence to space, Space 2.0 was launched. This phase, characterized by the space race between the United States and the Soviet Union, culminated in the Apollo moon landings in 1969 and continued throughout the Cold War. As the competition between nation states decreased, Space 3.0 started, with ambitious plans such as the International Space Station (ISS), which could only be executed by collaborating with partners. Nevertheless, space was still limited to a handful of powerful states and few, mostly large, private enterprises. Today, the space industry is undergoing a paradigm shift, moving from Space 3.0 to Space 4.0, driven by changes in motivations, actors, roles, and technologies. While Space 3.0 has been characterized by large government investments and public-public collaborations, Space 4.0 is a more democratized and accessible field with more public-private and private-private collaborations. It entails the emergence of a plethora of small to medium-sized private companies. In fact, we are already in the middle of this movement. Since 2000, roughly 350 private space companies have been established, and the growth rate of newly established firms is accelerating rapidly. 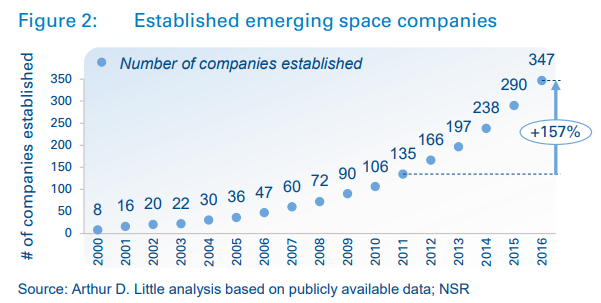 As illustrated in Figure 2 below, with the rising opportunities in Space 4.0, the number of space companies established per year has more than doubled in the past five years. This momentum has also sparked unprecedented private investments in the space sector, with 112 venture capital deals worth nearly USD 3.9 billion in 2017 alone – approximately double the annual budget of the Japanese Space Agency, JAXA. An identity crisis for space agencies? As the space industry evolves, so do space agencies’ roles in it. When the first space agencies were established at the start of Space 2.0 in the 1950s, they were the single champions and main actors and investors of their national space sectors. Today, a space agency is one of many space participants and needs to redefine its place in the national space sector. The NASA example illustrates well the dramatic changes that space agencies are exposed to. At the peak of the space race, NASA’s budget was 4.5 percent of the US federal budget. Nowadays, it is below 0.5 percent, which implies that NASA has undergone a transformation. Broadly speaking, NASA has had to reinvent itself three times since its inception, in line with the evolvement of the space industry, as described by NASA veterans in a recent article in the Harvard Business Review1 . Space 2.0 – Traditional NASA: During this period, space was both a frontier market and a competitive endeavor between superpowers (the space race). NASA, building on its military heritage, developed and used technology internally and maintained high control over a select number of contractors. NASA, a centralized, hierarchical entity, was the space sector’s prime contractor and exclusive customer. Space 3.0 – Transitional NASA: With the Cold War coming to an end, the US’s space ambitions changed towards exploration of deep space. As these missions became more expensive and complex, it was no longer possible for a space agency to conduct them on its own. While NASA was still the main actor in the national space sector, the need for collaboration with other space programs increased. The prime example of this is the collaboration on the ISS2 , in which NASA partners with the European Space Agency, JAXA, the Canadian Space Agency and Roscosmos. During this transitional phase, NASA learned how to function within a cluster of partners, as opposed to being the dominant party in a supplier/buyer relationship. This demanded shifts in cultural values, relational approaches, and technology strategy, which helped to prepare NASA for Space 4.0. Space 4.0 – Network NASA: NASA’s latest transformation, in line with the space industry’s movement towards Space 4.0, started with the Commercial Resupply Services program, launched in 2006, to carry cargo to the ISS after the space shuttle was retired. The shuttle’s retirement, budget pressures, government interest in promoting commercial space, and rapidly growing commercial expertise in space led NASA to seek suitable commercial partners. NASA is now a more outwardlooking agency that recognizes the innovative capacity of the market and has learned to work effectively with the commercial sector. For the most part, NASA successfully completed the transformation into a key enabler of Space 4.0. However, in light of the ongoing paradigm shift in the space sector, with the private sector increasingly performing activities that used to be in the traditional domain of space agencies, most agencies are still rethinking their roles. The possible roles of the future agency are manifold and need to be adapted to its local context. Enable the national space sector. Foster private sector growth and attract foreign business. Define and communicate a clear vision and strategy. Establish a conducive and strategic regulatory framework. Be the national space sector’s international face. Enable the national space sector: The future agency should define and pursue initiatives to enable private and public space sector participants. This includes providing access to infrastructure, creating human-capital development programs, providing targeted funding and promoting the space sector. Case study: The UK Space Agency (UKSA) runs and funds programs to raise awareness and interest in STEM and space. These programs include Destination Space and Space for All, which provide various funding schemes (including grants) to education projects focused on space-related technologies and STEM, with the aim of increasing the younger generation’s involvement in space R&D. A key characteristic of Space 4.0 is the increased participation of private space actors. More and more of these are international and are looking for the best national space ecosystems in which to thrive. Therefore, the future agency should introduce initiatives to attract foreign investment and foster private sector participation in the national space sector. Case study: Established within the Ministry of Business, Innovation, & Employment, the New Zealand Space Agency (NZSA) has a clear mandate to attract the private sector and encourage it to set up private spaceports and launch from its territories. The agency has leveraged its favorable location and enabling regulation to do this. NZSA’s strategy has attracted Rocket Lab, a smallsat launcher, to set up a wholly owned subsidiary in the country, and build and operate a commercial spaceport focused on micro- and small satellites: Established within the Ministry of Business, Innovation, & Employment, the New Zealand Space Agency (NZSA) has a clear mandate to attract the private sector and encourage it to set up private spaceports and launch from its territories. The agency has leveraged its favorable location and enabling regulation to do this. NZSA’s strategy has attracted Rocket Lab, a smallsat launcher, to set up a wholly owned subsidiary in the country, and build and operate a commercial spaceport focused on micro- and small satellites. Together with the executive power, the future agency should continue to set long-term strategic objectives to provide clear direction to all participants of the national space sector – both public and private. In addition, each participant’s roles and responsibilities in the national space sector need to be defined. This is typically achieved by defining a comprehensive national strategy and communicating it to all actors of the sector through a space policy. Case study: On June 28, 2010, President Obama issued the US National Space Policy, which provided comprehensive guidance for all government activities in space, including the commercial, civil, and national security space sectors. This new policy leans farther towards supporting US business interests than any previous space policy. Together with the relevant regulatory authorities, the future agency should continue to enact a regulatory framework that provides legal certainty and serves as a strategic tool to enable and incentivize private sector participation. Case study: Building on its legacy of creating a commercial satellite communication industry, which currently represents around 2 percent of its GDP, Luxembourg is committed to expanding its commercial space sector. Towards that end, the country has leveraged its legal framework to attract private sector investors. Similar to the US Commercial Space Launch and Competitiveness Act of 2015, Luxembourg’s space law of 2017 stipulates that companies that are operating within the Grand Duchy’s territory (e.g., have offices in Luxembourg) may legally own resources acquired from celestial bodies. Luxembourg (like the US) has set an international precedent by enacting a space-mining law linked with significant growth of its commercial space sector. Thanks to this favorable regulatory framework, international space-mining companies such as Deep Space Industries now have operations in Luxembourg. Since Space 3.0, space exploration has been a truly international endeavor. The future agency should continue to forge international collaborations (e.g., leading space agencies, governments, aerospace companies, academic institutions) to be fully integrated in the international space ecosystem, participate in major projects and build local know-how. Case study: The United Arab Emirates Space Agency is enabling the UAE’s space sector and complementing Mohammed bin Rashid Space Centre by establishing international partnerships in the space sector and representing the country at space conventions and international forums amongst other activities. In line with the space agency’s traditional role, the future agency can be involved in driving strategic space activities such as science missions. The activities assigned to the agency should not put it in competition with other actors of the sector. Therefore, they should be limited to strategic space activities that are not fully pursued by other actors of the national space sector due to their scope, economic viability or other reasons. Case study: As commercial space organizations have begun to drive more low-earth orbit activities (up to 2,000 km from earth), NASA has had to shift its efforts toward exploring deep space, accomplishing further manned missions, and setting up permanent facilities on the moon as a gateway for missions to Mars and beyond. Cases in point are NASA’s launch activities. While in the past NASA was the sole developer of launchers in the U.S., today it has outsourced most of its launch activities to companies such as SpaceX or ULA and is actively supporting these commercial actors (as stipulated in the Commercial Space Launch Act). NASA’s focus in developing launchers in-house is on its Space Launch System (SLS), a heavy-launch system that is required for deep-space missions; NASA has no explicit plans to commercialize SLS. Is there a clear vision and strategy in place for my space sector that gives a clear direction and sets long-term development objectives and priorities? Are the initiatives that will implement the sector strategy clearly defined and adequately empowered (e.g., funding), and do they have clear responsibilities? Is the space sector’s regulatory framework conducive to the strategy by assuring legal certainty and serving as a strategic tool at the same time? Are the required international partnerships in place to assure the national space sector’s integration into the international ecosystem and help localize know-how? Is the space agency’s role in the space sector clearly defined, and does it facilitate cooperation and support of the private sector to truly enable the space sector? Is the space agency’s organizational structure agile and outward-looking, in order to embrace innovation and partner with public and private actors?